Many thanks to all the people who sent us donations and to all our sponsors us for funding our project. Many new features and improvements were developed since the last release. We’re now just days away from feature-freeze, trying to squeeze one last thing here and there, before wrapping things up and focusing on the new release. I’d also like to thank and welcome 3CX and Acunetix as our new sponsors. Acunetix specializes in web audit and web application security. Linux Mint 18.1 was given its official codename today. It will be called “Serena” and it should receive its new repositories in the coming days. MATE 1.16 is out already and Cinnamon 3.2 is just around the corner. Linux Mint 18.1 should be released in November/December 2016 and it will be supported until 2021. Upgrades from Linux Mint 18 to Linux Mint 18.1 will be handled by the Update Manager. They will be both safe and easy to perform. I can’t show you everything and I can’t really go into the details here, so I’ll just show you a few cool things which landed already. As you can see, applet and desklet menus look different than before. They lost that gap they previously had with the panel or the desklet, and that distinctive pointy link which they inherited from GNOME Shell. When we worked on Plasma 5 for the KDE edition of Linux Mint 18 we were impressed by how polished their menus looked. So we decided to redesign our menus, get rid of box pointers and re-implement the way menus appear in Cinnamon. We’re still tuning animations and working on borders, positions and gaps but we already know the end result will make Cinnamon look more polished than before. It’s much lighter and responsive than before and it shows media controls when multimedia is playing, so you don’t need to unlock the computer to mute it, to change the volume or to switch to the next song. In addition to showing you mirrors based on your location, the Software Sources tool now supports “worldwide” mirrors. These mirrors are anycast IP global mirrors, i.e. they have servers in different regions of the World and redirect your requests to the one that is closest to you. Support for languages was also improved. Language pack detection now checks for spell checkers, fonts and a variety of other packages. The selection and installation of input methods was also completely redesigned. 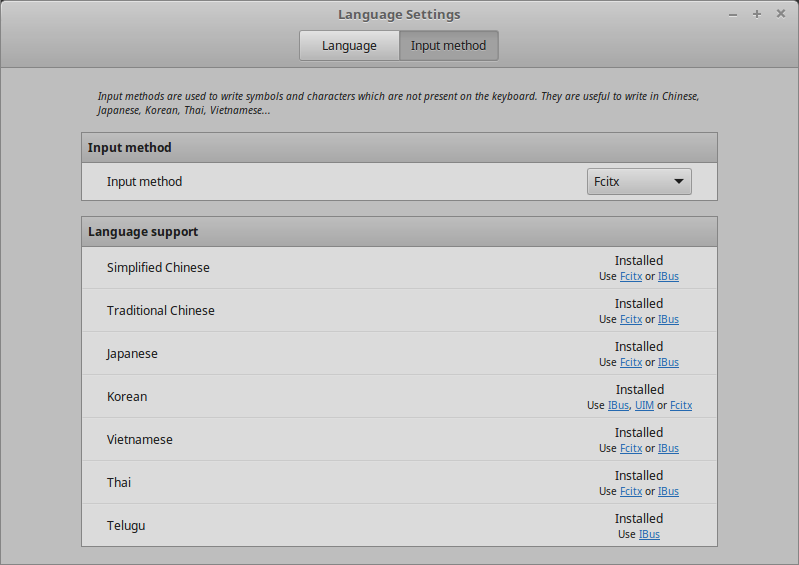 You now choose which language you’re interested in, and this installs support for typing in this language and recommends methods to select. $100 (4th donation), Roy Q. $100 (2nd donation), Allan G.
$88 (3rd donation), Thomas K.
$54 (2nd donation), Daniele G.
$50 (5th donation), Robert H. B. $50 (3rd donation), Christopher D.
$50 (2nd donation), Arthur A. $50 (2nd donation), David S.
$43 (4th donation), Richard C.
$35 (2nd donation), Jeff S.
$32 (79th donation), Olli K.
$32 (4th donation), Paul A. $32 (2nd donation), John C.
$27 (28th donation), Mark W.
$27 (3rd donation), Stephan U. $27 (2nd donation), Igor B. $27 (2nd donation), Jan B. $27 (2nd donation), Cornelis H.
$25 (62th donation), Ronald W.
$25 (3rd donation), Oswaldo H.
$25 (2nd donation), Jeffery J. $22 (9th donation), Dr. R. M.
$22 (2nd donation), Detlef W.
$20 (2nd donation), Anton R.
$20 (2nd donation), Steven H.
$20, Luis R. C. P.
$19 (2nd donation), Stefan V.
$16 (3rd donation), Heinz K.
$16 (2nd donation), Richard G.
$16 (2nd donation), Gerald G.
$15 (4th donation), Devon B. $15 (3rd donation), Ray P.
$15 (2nd donation), Al H.
$12 (7th donation), Stefan M. H.
$11 (11th donation), Andreas S.
$11 (10th donation), Tomasz K.
$11 (9th donation), Francisco L. D. A. $11 (6th donation), Bo J. $11 (6th donation), Stoyan N.
$11 (6th donation), Joshua R.
$11 (4th donation), Rüdiger K.
$11 (3rd donation), Bjørn M. J. $11 (3rd donation), Davide A. $11 (3rd donation), Viktor F.
$11 (2nd donation), Steve K.
$11 (2nd donation), Curtis R.
$11 (2nd donation), Ørnulv A. $11, Francisco P. D. L. G.
$11, Daniele N. – Thank for your great work! $10 (10th donation), Thomas C.
$10 (10th donation), Mike C.
$10 (7th donation), Larry J. $10 (6th donation), Rolf V.
$10 (6th donation), Larry J. $10 (4th donation), Andreas S.
$10 (3rd donation), Frank K.
$10 (3rd donation), Jeri H.
$10 (2nd donation), Heston L.
$10 (2nd donation), Gerald M.
$10 (2nd donation), Fernando C.
$10 (2nd donation), Tomasz E.
$10 (2nd donation), Marcelo S.
$10, Jose A. M. L.
$8 (2nd donation), Matīss J. $7 (2nd donation), Юрий Л. $5 (5th donation), Eugene M.
$5 (4th donation), Benjamin T.
$5 (3rd donation), Matthew B. $5 (3rd donation), Ronny G.
$5 (2nd donation), Matthew B. $5 (2nd donation), Jim A. $5 (2nd donation), Ellert H.
$5 (2nd donation), Vladimir P.
$5 (2nd donation), Vladimir U. $5 (2nd donation), Johannes J. $5 (2nd donation), Emanuele P.
$5 (2nd donation), Björn H.
$5, Miguel D. L. F.
$5, Francisco J. C. C.
$5, Edson L. H. C.
$3 (2nd donation), 李 梓. $2 (2nd donation), Pedro A.
Edit by Clem: We’ll continue to use the KDE version shipped by the Kubuntu backports. Hopefully it might be 5.8 by then (I think the main issue isn’t for Kubuntu devs to backport Plasma itself but Qt without causing regressions to non-KDE Qt apps on the Xenial base). Clem likes American Football? Sacre Bleu! Hey clam, can you please consider to add a option in nemo to secure a folder or crypt a folder? Thanks. Can you please add an option, like “online accounts” in gnome control center, to settings? Secondly, will there be different icon color options for Mint-Y icons? Edit by Clem: Hi Bora, there won’t be color variations for Mint-Y in Mint 18.1. There will be improved support for dark themes in Mint tools and Xapps though. nice work, as always! I’m a big fan of the new screensaver, especially. Now if you also redesign the Mint-Y “Logout”- and “Quit”-Buttons, Mint-Y would lose it’s last 2 design flaws. Improvement is possible at anytime, but then the Mint-Y theme would be at a really awesome state. It’s looking really aesthetic already. Also you maybe could set Mint-Y as default theme. Best wishes, keep it up! Clem, Beta Release of Serena for when ? Great stuff Clem, never liked the box pointers! 1) Is there any plan to look into the screen tearing issue? Quite a few of us are getting this in 18 but it was fine in 17.1? 2) Slightly OT, but I can’t seem to get an answer to this through any other channel- do you want desktop environment related suggestions in the ideas forum or not? There are continual back and forth discussions about this in the ideas section and a definitive answer would increase the signal to noise and potentially save a lot of wasted posts. Edit by Clem: That’s an issue with drivers and xorg. I know the Intel chipsets are hit by a regression here in Mint 18. Regarding suggestions, it depends. When they are posted on the forums they’re usually not read directly by the dev. team, but good ideas do get reported to us. Hi Clem, thanks again for your team’s work and of course yours! But: Cinnamon 3.x with LM 18 unfortunately suffers from a serious mistake in a VM with VMWare Fusion on my Mac. It offers kind of translucent Windows so that working with many apps like Libreoffice etc. is more or less impossible. These mistakes appear neither on LM 18 Mate nor XFCE. I have no idea if this mistake is caused by VMWare or by Mint Cinnamon, but I hope it will be corrected in LM Cinnamon 18.1. Greetings from Germany to everybody there! Edit by Clem: I think it’s a VMWare rendering issue. But please check this https://github.com/linuxmint/Cinnamon/issues/4870, there’s a workaround at the end. Does the new Cinnamon perhaps also contain a fix for the race condition that I encountered in the Cinnamon of Mint 18? Edit by Clem: Background handling was redesigned so “maybe”.. I can’t say for sure. WOW! Almost all of the fore mentioned features I’ve been wishing for so long! You are awesome, thank you for all that great effort! How do you set refresh rate for monitors in Cinnamon? There is no GUI for that unless you are using Nvidia proprietary driver. Is an upgrade to MATE 1.16 to be expected? Surely it would be greatly appreciated. Thanks for your excellent work. I am really looking forward to installing Cinnamon 3.2 since I am using a convertible book (Lenovo Yoga 900) and the auto-rotation is smth what I miss currently every day. Will Cinnamon 3.2 also provide functionality for better touchscreen/tablet experience (when changing Yoga to tablet) like keyboard locking, automatic virtual keyboard when touchscreen using, touchmultigestures (scrolling, etc.)? I am also curious how windows management will work with Cinnamon 3.2, screenshot looks like no place for open applications – will it be a dock similar approach? I would love to use a dock with symbols only but I cant use cairo dock/docky since no support for hi-dpi. It would be great if basic dock functionality for symbols only would be provided!! Edit by Clem: Hi Richard, we’ve got libinput support and screen rotation with accelerometers in Cinnamon 3.2. We’re also looking into adding gesture support in Xapps (I can’t say whether this will get in in time though). @Surena, I think Cinnamon should support both box pointers and the lack of them. Maybe an option in Themes? In particular, I think box pointers fits Mint X, but not as much with Mint Y, a more modern theme. @Clem, is there anything you could do with that? @Clem, three other things I’d like to see would be some enhancements to Mint Y (I’d like an option for transparency like arc-theme, one of the themes Mint Y’s based on, and give support for it in GNOME apps and Nemo), a renaming of MDM’s package (mintdm would work as a package name, while avoiding conflict with another program named ‘mdm’), like with xed, and last but not least, an option to turn on/off use of GNOME’s header bars in GNOME programs, as then people like me can enjoy header bars, while some that hate them won’t have to deal with them. Edit by Clem: I’m yet to find anyone using Debian’s “mdm”. If you’re using it though, I’d be happy to consider renaming the packages. It isn’t possible to support box pointers. I know it sounds like a small change that could be optional, but it’s actually quite big and we can’t just “enable it”. There’s no demand for CVEs but we will eventually switch the two blogs to https yes. We’re discussing a new feature at the moment which would make mintupdate gain knowledge of kernel support in the various series and warn the user appropriately. So for instance, it would tell users 3.19 is EOL and suggest an update towards 4.4. The idea isn’t just to implement this for 18 but also to backport it…. and last but not least, GNOME apps… well… I asked GNOME for that kind of control. I wanted the DEs to be able to set GTK in a way that would tell the app whether a headerbar is prefered or not, so that devs could implement both UIs. This was rejected. The situation right now is that headerbars are inhibited by Ubuntu, and this is done very roughly. It’s better than nothing but it’s not ideal. The solution to this, imo, is Xapps… it’s for us to use proper UIs in forked apps and let GNOME users enjoy GNOME apps which are no longer patched. Well, it will be odd without box pointers, other than that, looking great and can’t wait to see this version of Cinnamon on feren OS, also, is Mint-Y default now? PS: Hopefully you may even bring them back as a theme-maker’s option… They looked cool, there again, so does this! Edit by Clem: No, Mint-Y is installed by default but not the default theme. Box pointers cannot be brought back or enabled. Thank you for implementing in the Notification panel when a new email arrives in Thunderbird. Could you please also add to the Notification panel when a new Chat message arrives in Thunderbird? Thank you. I like the box pointers. They add a touch of class and character. They are also very functional. Also, I like my PC to be locked when its locked. I wouldn’t want someone else coming up to my locked PC and adjusting my sound settings. Edit by Clem: This can be configured and I don’t think the controls show up when you’re not playing anything. Edit by Clem: Well.. yes and no. The button color is actually dynamic but Mint-Y only ships in green at the moment. Hey Clem, on feb 2017 will you guys release a new LMDE based on Stretch? With the new cinnamon version? Edit by Clem: It’s too soon to talk about LMDE 3, but in any case you’ll see Cinnamon 3.2 in Betsy before that. I know this is a bit off topic but I really do miss Mint 8 the version with Fluxbox. I was wondering why was it so short-lived and is there ANY intentions of reviving that particular version. IMO that version was the best version of all of these Linux Mint bar none. I have a quick question: For example now when I want to type in Chinese the “Language Settings” screen will install only the Chinese specific tools? Also the other improvements are nice specially the screensaver – it’s awesome! Edit by Clem: Hi Georgi. Yes. For instance, if you install support for “Traditional Chinese”, it will install both Fcitx and IBUS, but only the packages required for traditional Chinese (not the ones for Japanese, Korean, etc…). Edit by Clem: I don’t think so no. If issues weren’t addressed or bugs weren’t fixed and this was an ongoing problem, then maybe. But the reason people use Xfce isn’t for it to develop new features, they use it because it’s known to work well, to be stable. With this in mind, I don’t think it matters how long ago the last version was. People are happy with it, and that’s really what matters to me. Sorry, Clem, I was not totally clear. I was thinking about Mint-Y window buttons color. Dark theme is fantastic, it’s just that I would like the option to change everything in blue. Do you have plans to include that like you did with folder colors? I don’t like removal of box pointers. They are really cool. Also I don’t agree with moving to KDE-like flat design. Flatness is ugly. And I think Linux Mint 17.3 Cinnamon’s windows design looked better that it look at the latest release. LMDE 2.5 with lxqt would be really awesome to have. Good day. I recently installed XFCE Mint 18.0 (Sarah) version after taking a long break since “Helena” version and up until now I’ve been heavily using Gentoo and Gentoo-based distributions. I worked at optimizing Gentoo performance using CPU flags and specific to my CPU architecture CFLAGS to compile software optimally. I was quite happy with my Gentoo until during one of my upgrades wireless connection broke. I didn’t want to fiddle around trying to fix the wireless issue so I decided to give Mint a try and, wow, I am really impressed with Mint 18 XFCE! It’s not just the fact that everything works out of the box – even my Android Galaxy S7 is mounted and recognized without any additional configuration so I can easily put files into my Android device, what impresses me the most is the performance! I mean XFCE is known for being a lightweight DE but the responsiveness and behaviour of applications in Mint 18 XFCE is almost identical to what I had on my optimized Gentoo or the difference is so insignificant it’s not even noticeable! Clem – are you re-compiling Mint from source to produce optimized binaries? What is your secret for making Mint 18 function so responsively? I am very happy with Mint 18 XFCE. Good job! Edit by Clem: Hi Victor, no there’s no optimization at play here, certainly not the way it happens in Gentoo. Edit by Clem: It’s the pointy shape coming out of the border of an applet/desklet menu. I have been using Mint for several years and like the progress you have made with 18 (I started with 7). It is a nicely polished OS and works flawlessly for me. BTW, all versions have worked just fine with my 2 Brother printers. I am so happy I don’t have to use Windows! It would be nice if you would add a repeating donation capability. I would like to make a small donation every month rather than a large one occasionally. Easier to budget. Edit by Clem: Hi Michael, thanks for helping us. Minimum amounts were introduced to stop SEO companies from spamming our sponsorship programme. It’s also worth noting that Paypal takes a fixed fee on each transaction, it doesn’t make much difference on large sums, but it can be quite significant on repeated small amounts. Hi Clem, I was wondering if it would be possible to have Banshee 2.9 with the upgrade. I’m having a lot of freezing problems with Banshee 2.6 since the upgrade to Sarah. It seems it happens if the music library is too large, and I found that some people have switched to the latest version to avoid that. I would love to continue using Banshee, but I would much prefer to use the version provided by the official sources. I also hope that my energy management will start to work properly again after the upgrade. I had to stop using standby mode as the computer won’t wake up properly from it – the screen just stays black, and I haven’t found a solution or workaround for it yet. That’s much less of an issue for me, though. In any case I’m looking forward to Serena very much! I’m sure it will be very nice and there will be lots of improvements as always. Good job! Edit by Clem: Are you sure you’re talking about 2.9? Version 2.9.1 is both old and unstable.. it was released in March 2014. Can you mention the exact version number and the source you’re getting it from? Also please mention bugs you see in the Mint version which don’t happen with that version. (The version used in Mint is 2.6 + upstream commits from the master branch). Mint-Y icons are using the icon of Mint-X for places. Will there be new Mint-Y icons for places or do you have plans on changing them? If the plan is still to change them, are you open for suggestions regarding these icons or do you have already some specific new icons in mind? I’ve been looking at linux mint for quite some time now, and changes you guys made are really good. I suppose it is going to a big update for Cinnamon with Vertical panels, revamped screensaver and lot more so can we expect romeo packages soon to facilitate good amount of testing. I have asked this multiple times – but since you spoke about KDE I want to point out that I really miss many of the kRunner capabilities in Cinnamon. May I please request you to plan for it in your roadmap? Thanks. Please change when the context menu appears, so that the context menu appears after the right mouse button is “released”. Currently the context menu appears when the right mouse button is “pressed”. This would enable a right mouse button press and hold on files, moving the mouse to another folder/directory, then a right mouse button release with a context menu that could say: Move, Copy, Create shortcut, Cancel. For more information, please see the XFCE Desktop Environment as this feature is implemented there. It would be nice if it was implement in Cinnamon too. This would enable the context menu to have different items if the location of the mouse is “different” from being “pressed” and “released”. Can the context menu in Linux Mint be customized? I use Cinnamon nightly. The context menu opens here, when the mouse is released. So this was changed. Sorry, I misunderstood you. I thought you were talking about the context menu in the menu-applet. For regular files (on nemo) the context menu still opens on press, not on release. I think the changes are higher, that your request will be considered, if you create a feature request on github, if it doesn’t exist already. I think the right place for this would be here https://github.com/linuxmint/nemo. I’m not sure though. Can you please fix the default installed bluetooth-modules? They are not working and are even having a negative score in the software-center. The blueman-applet is working out of the box. Hi, I just installed Mint 18 and it’s amazing but the only problem that I see is that the connections to the servers are very slow, and no, it’s not my computer or my internet I also changed to the “fastest server” with the update manager but still like a turtle. Suggest you make pulse audio volume control a default installation. For those of us moving from Windows, it’s ridiculous making getting sound from HDMI a problem to be solved by the user. The default installation of this package vs. the simple sound app included in Mint would make it so much less frustrating for newbies. Isn’t that what Mint is supposed to be about? Brilliant work on the OS – I’ve now been windows free for 12 months! Slightly random question: I suspect this is a question for Apple but thought I’d ask you in case you had a clue but I used to be able to connect my iphone 5c to Cinnamon Mint 17.3 via standard USB port without any problem (downloading data photos etc). Since the Apple upgrade to ios 10 there appears to be a trust issue with Mint – can you confirm that nothing has changed with the Linux Mint end and/or you have any ideas what might have changed or how I might get round it (other than regressing the phone’s OS). On HP Stream, the “Caps Lock” and “Mute” keys have a light each. The light on the “Caps Lock” key is on and off when Caps Lock is on and off respectively. The “Mute” key is shared with the “f6” key. Unfortunately, when mute is on or off the light on the mute key is always off. Could the light on the “Mute” key be implemented to be on and off when the Mute is on and off respectively? Sorry if I’m being inconvenience, but again about LMDE 3, what are the plans? Nowadays I’m really excited about the linux universe, still learning about, but thinking in contribute on some projects. These projects are Debian (because I like the propose of being stable and relyable) and Mint (Well polisheds systems and user-friendly, and the best way-in for Windows users), but I don’t know what exactly I need to improve before involve directly on dev team. What exactly I need to learn before that? C? C++? Python? Of course that will take time, especially because my poor english slows me a lot, but learn english and french are already part of my plans (I noticed there is missing documentation in Brazillian portuguese, my main language), and learn C, C++ and others progamming language too because i’m starting to course Computer Science here. So, can you help me telling what I need to learn and where can I find updated information about LMDE development course? Thanks in advance, and sorry for any gramatical/ semantic error. Can you please add “Download complete” (or failure) to the Notifications, similar to how Notifications says “Printing complete”. It takes quite some time. Once download is complete it would be nice if a message appears. Can you add “Disconnected from server” etc which FileZilla shows to Linux Mint Notifications? Can Notification be customised? For example, by default are Notification set to *not* show if a LibreOffice Impress presentation is being shown? I really like the box pointers too, it’s one of those little things that makes mint (cinnamon) different. I think the menus in the video look tired and boring rather than elegant and polished – just my two cents. It seems a lot of focus on themes and artistic side of mint recently but it’s actually making cinnamon harder to use – title bars are not clearly separated at top of application windows and vertical scrollbars are difficult to see. And in the meantime version upgrades from my original 17.x install have broken both the weather applet and bluetooth. I appreciate having a choice though and I can go back to 17.x or back to Mate. Thanks for your efforts mint team. Hi! Is new screensaver only for cinnamon? or mate too? i have a question,besides this destro and just anothor 1 of gnu/linux kde plasma versions,all pass on plasma 5.7.5,why do u guys still use old version of plasma on mint kde ? I just decided to upgrade my 17.3 laptop to Mint 18, and as the mintupgrade failed (a problem with the texlive packages that could not be solved with apt-get -f install) I had to perform a fresh istall, followed by the re-installation of all software packages and settings. In this process I come across a problem I had several times, all my fresh installations of every Mint version since a long time, to recover my Wine menu as I simply restore my .wine directory from backup. An useful addition would be to have some tool to perform this. Looks very promising. Hopefully, the desktop background issue will be resolved where certain updates trigger the default background to display instead of keeping the one that I’ve selected. Would be nice if all icons always showed up on both screens instead of me having to turn off icons, then back on. other than just a couple of pesky ongoing issues, things are really good with 18. Can I play audio books that were recorded with WMP on your OS? I have been using windows for years and everything I have is on windows and I don’t want to lose anything! Or be prevented from using or playing anything either. I’m new on Linux desktop, just switched from Win 10. I’d like to know if the new version has better support for HiDPI screen (mine is 3200 x 1800). Right now Spotify and VirtualBox all have tiny text and menu, and are hardly usable. I assume these are .wma files since you mention WMP (windows Media Player)? As included with Linux Mint, VLC media player can play just about anything you give it including .wma files as I have just confirmed. I too have some old .wma files in my music collection. You could install Mint in a dual boot arrangement with Windows if you don’t want to loose any of your favourite Windows applications if you’re using a laptop, say. Linux can read FAT32 and NTFS file systems which is good for reading your old file collections. You could set up a stand-alone installation of Mint on a separate hard drive and copy over your media collection. This would be a cost free and totally risk free experiment that would let you play with Linux and do anything (even crazy things) with no risk to your Windows installation. If you don’t have a spare hard drive, you could buy a small and cheap SSD and store your media files on an external USB drive if your collection is very large. I’ve NEVER liked monopolists. This is why I hate Windows and everything about it. I started working with UNIX in 1980. When Windows came out I thought it would be a joke. Well, as we know, the joke was on me. To see where Linux has come in the years since I am absolutely ecstatic and amazed to see open source products like Mint gain so much adoption. 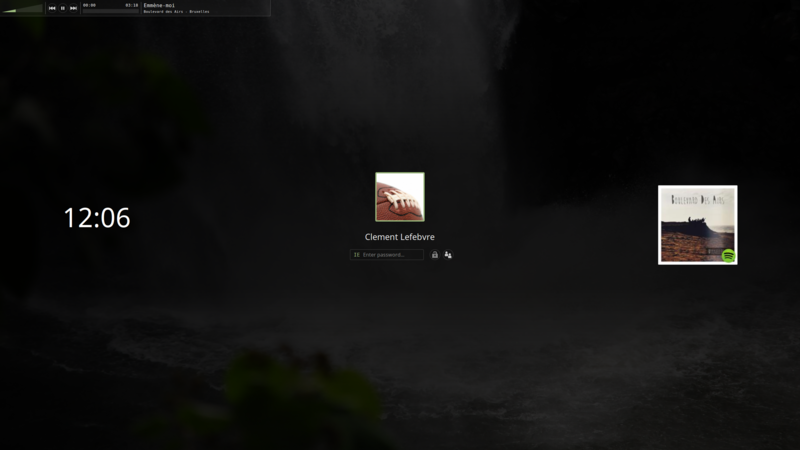 Hi Clem, my compliments for the work you and your team regarding Linux Mint. There are a few wishes. I am a volunteer for a computerhelpdesk. We give free support specialy for older people in the Netherlands. everytime we install a LinuxMint on a computer we have to enter after each command regarding updates a password. Would it be possible to give it a kind of time so that a password is valid for a specific time (say 10 minutes). Also would it be possible as an option to auto update without interfering from the user? In my opinion the box pointers made the menus seem somehow disconnected from their origin so I really like the new look. Maybe you could add a subtle gradual slowdown to the movement of the menu just before it reaches it’s opened or closed state. Linux Mint 18 is awesome! But I found a “bug”, there is no possibility to disable showing menubar in terminal forever. Despite the fact, that there is a possibility shown in help (probably from previous version). I’m used to using terminal without menubar and that would help me a lot! Mint 18.1 whats version kde 5.8 5.9? 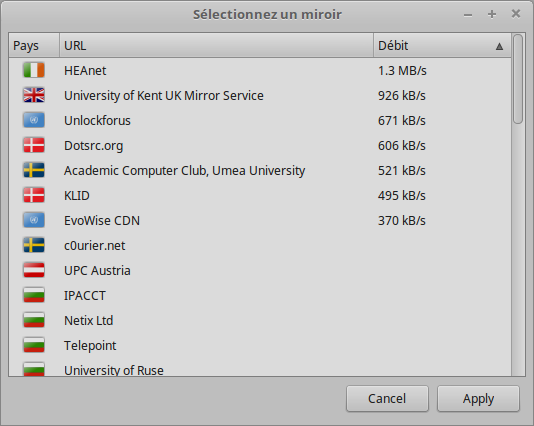 Does Linux Mint download the User Interface (UI) language translations for Mozilla Thunderbird add-ons? If the system locale language is set to magyar (Hungarian), Thunderbird 50.0b3 menu is Hungarian (magyar); however, the Lightning 5.2b3 add-on is still in English as shown in the “Events and Tasks” menu item. Removing boxpointers will make Cinnamon clean. Can you redraw File manager? I mean left panel (places). It looks simple and flat in Gnome FM. I have a severe and fundamental problem with Mint 18 KDE : The desktop search (baloo) does not work! I have all my folders and documents on a partition that I have mounted via fstab to the original folder “dokumente”. So I assume that folders with symlinks are not included in the search? Also dolphin search and parts of kmail search do not work! And as I already reported: thumbnails for PDFs and movies do not work (even with the necessary additional packages installed). You can contact me for further details, if needed! And there were significant problems with NVidia drivers for my Optimus 645 card when using transparency! Just an additional remark: The NVidia issue also prevented standby mode in many cases. Now with nouveau it works fine again, but of course it would be nice to be able to use the NVidia drivers again. Is is possible to have the scrollbars visible if the mouse pointer is not over the control (like it was in Mint 17 and before)? I hate the way it looks now. BTW: Video “taken by Joseph” is not shown, I just get a black rectangle. I’ve had some bugs/issues ongoing on my laptop since LM 17.1. Sometimes when I open the lid to wake up my pc from sleep, nothing loads, the screen is black, I hear the fans and everything but I can’t do any commands but to hard restart. It happens to me now every now and then. Not too often but it’s enough to leave me nervous every time I open up my laptop. It doesn’t seem to matter what kernel I run as I have multiple installed (the default one plus several recommended from the Update Manager, and one manually installed 4.7). Other issue is with the Update Manager. I get an error message every time I check for updates. I’ve searched for solutions online but nothing helps. Lenovo G50 80, core i5 2.2Ghz, Radeon GPU M330 2GB, 12 GB RAM, 500 GB SSHD + 500 GB HDD. I’m a happy user of Rebecca in my everyday computer but downloaded Serena when I finally convinced a coworker to “come to the dark side”. His computer is rather old but has 1.5 GB RAM so I suggested Cinnamon. I fell so in love with Serena that I just installed it in an extra partition I had unused in an old HPmini and will be upgrading the other one ASAP. I just realised I said I was enjoying Serena, but it was Sarah! I forgot I was running Rebeca! Just a few weeks till Serena!! Hello. I’d like to report on some more issues I’ve had with LM18 Cinnamon. Every so often my WIFI stops connecting to any network, or even showing any networking. Turning my Wifi on or off on my laptop doesn’t help. For some reason, sometimes it shows only one network out 20 that are surrounding my machine. This often happens when I close my laptop and take it to the school to connect there. It’s not regular, it’s not always. But it’s too often. I have to restart my laptop to be able to connect again. It’s a weird issue and I haven’t had it before on LM17. Lenovo G50 80, core i5 2.2Ghz, Radeon GPU M330 2GB, 12 GB RAM, 500 GB SSHD (+ 500 GB HDD I installed). After updating, the microphone started to work. Why isn’t that known bug not available in the patches provided by the software-updates? So, what about LM 17.4? good distro. using 18 Mate. 95% off of Windows. If game publishers only made more Linux versions of MMOs. I would be off it entirely. The Driver Manager recommended that I update the driver to the nvidia-367 driver, which I did of course and then restarted. The Nvidia X Server Settings utility (available in the Software Manager) let me check the GPU usage, clock rates, temperature, fan speed, etc. as I gave it some stress testing. It’s been a very smooth hardware update experience so many thanks to the Mint development team for that. This new update looks very good except for one thing: box pointers. They looked very good and it was one of the reasons I use mint. If someone didn’t like them they could already use a theme without them. Please, don’t remove it. Dear Clem and Linux Mint developers. I would like to express my gratitude for a wonderful distro. Good luck with your work! 1) can teach Muffin effects ‘ magic lamp ‘, ‘ Wobbly ‘ window and do you plan to do in the future? 2) when will LMDE3 and correct there annoying misunderstanding with automatic layout drives, what would anyone could install it on my computer? 3) Is there a KDE? P:S: sorry for my English, talked with you via Google Translator. P. P. S: good luck! I had a similar issue. Since you are mentioned, that you bought a new laptop, are you aware of the problems, which can appear with UEFI and SecureBoot? I had the problem that LM was installed, but the Windows Boot Manager has always overwritten the Grub Boot Manager, hence just Windows booted. If it doesn’t help, open the application HexChat on a Linux Mint machine or LiveCD/USB. It’s a chatroom #linuxmint-help, where people trying to help other people with LinuxMint. I am a big fan n follower of mint. but I am facing few problems while use mint. 1. mint doesn’t come with popular Hindi language keyboard layout I.e. inscript and Remington. please incorporate these keyboards in languages. 2. Linux uses heavy power in laptops. someone told that installing tlp and thermald can help this problem. but we don’t know how to do it. please make tlp and thermald pre installed in mint like Ubuntu budgie. 3. we can’t configure wine as we have to use few windows software like quarks express and coral. please also help us to make wine as pre installed and configured software so that we can install both software with a single click. 4. alternatively you can ship new mint with some software preinstalled and configured that can install android app with a single click like chrome os. dear clem, these are biggest hurdles that we can’t use mint as default os but you do it giving some efforts. it will help us to erase windows completely. we would be oblige also.